(Bloomberg) -- The pound’s recovery on U.K. Prime Minister Theresa May seeking help from opponent Jeremy Corbyn to solve Brexit has yet to convince fund managers to bet on a big relief rally. Aberdeen Standard Investments is avoiding the currency given uncertainty and volatility remain high, while Investec Asset Management dumped its long position in the pound last week. It will take a decisive announcement on a Brexit deal and extension to inspire traders to go all in on pound strength, according to Janus Henderson Investors. 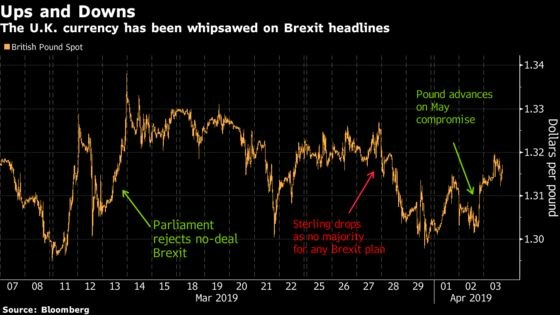 The U.K. currency has clawed back ground this week after falling in March, following May’s move on Tuesday to seek a compromise with the opposition Labour Party and Parliament’s vote late Wednesday to legislate against no-deal. Labour leader Corbyn, who favors closer ties with the bloc, and May described their meeting as constructive and agreed to appoint teams to continue the talks. The pound was up 0.2 percent at $1.3180 by 8:45 a.m. in London, taking gains so far this week to 1.1 percent. It is the best performer among major currencies this year, though has also been the most volatile among peers on shifting assessments of the risk of a no-deal Brexit. Hedge funds have raised their net long pound positions to the highest since December, according to the latest data from the Commodity Futures Trading Commission. Yet the build up in Brexit optimism, following the EU’s extension of the U.K.’s deadline to April 12, made Investec decide it was time to exit the pound, said portfolio manager Russell Silberston. Asset managers overall are betting against the pound and have increased their short positions, the CFTC data showed. Volatility is likely to remain high as more votes on different Brexit options are likely in Parliament in coming days, before an EU leaders meeting on April 10. The European Commission’s President Jean-Claude Juncker said British lawmakers must approve the agreement on leaving the bloc in order to win a further delay. Any confirmation of a short extension to the deadline would be a green signal for markets, but a long extension would not be viewed as positively, according to Janus portfolio manager Bethany Payne. “There is still room for a relief rally in sterling if we get an orderly exit from the EU, but the political risk in the short-term may enable you to get better entry levels,” Payne said.